The watercolor composition above was discovered on the same trip as Watercolors 18, but a little further up the coast, in Seattle. In contrast to most of my watercolor photographs, it is a man-made structure that is being distorted and reflected: Seattle's great wheel. 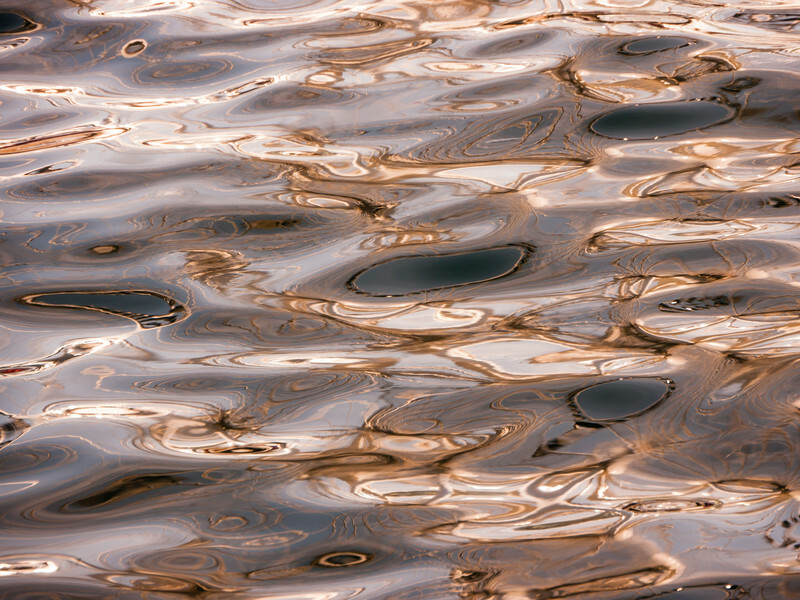 The waves and ripples multiply and distort the reflection and thus create countless versions of this attraction. This bewildering display and the overall color and mood of the composition remind me of another Seattle reflection photograph of mine: Spacy Space Needle (Carcolor 33), which features reflections and distortions of Seattle's landmark tower. In contrast to many of my photographs, this creation lacks a regular, geometric pattern and may seem rather chaotic. In my opinion, the dark grey spots, devoid of any great wheel reflection, anchor the composition. In particular the larger, oval shape in the center of the frame attracts the eye. In addition, there is a clear direction from the lower right corner, with countless great wheel reflections, to the upper left corner, where the reflections thin out. Nevertheless, this example is rather distinct and different from the ones shown in the watercolor gallery so far.